You are sitting on the couch at home when the shaking starts. At first it's gentle, perhaps just a heavy truck driving by. It could continue and grow into an earthquake, that looming event that lives in the back of every Tokyoite’s mind. Mother Nature herself answers by rattling your doors and swinging your light fixtures. The answer to these questions and many more can be found at the Ikebukuro Bosaikan, or Life Safety Learning Center, a veritable Disneyland of disaster preparedness, just 5-minutes' walk from Ikebukuro station. 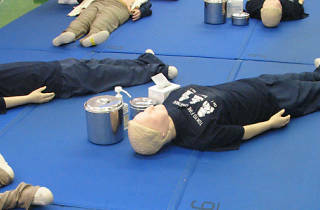 Free of charge and without any reservation, the Ikebukuro Bosaikan offers three daily tours through its all-age-friendly safety training course, where visitors can practice CPR on dummies, use a real fire extinguisher, escape from a smoke-filled maze and experience a strong earthquake simulation. The two-hour-long course is only available in Japanese, but it's possible to book a group tour and bring along your own translator or simply come with an English-speaking friend. The staffers speak some English, but this experience is best for those with some Japanese language ability. Regardless, the Bosiakan is a great way to acquaint your self with disaster awareness in Japan. A brief explanation on how to use those AED (Automated External Defibrillator) machines that have popped up all over Japan in recent years is included in the first aid training section. 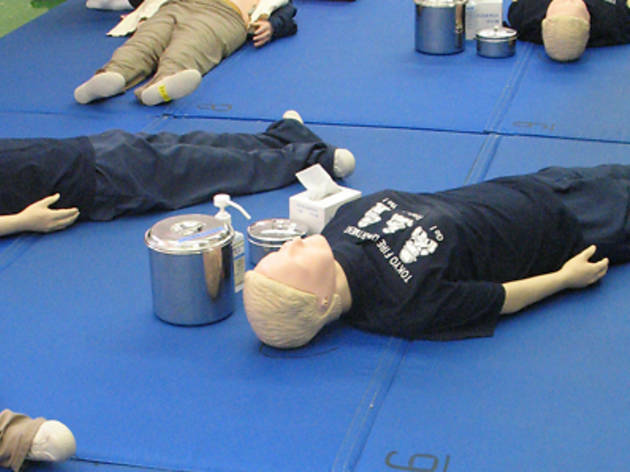 Participants can also practice cardiac massage on any of 11 dummies, who, sadly, do not spring back to life. Next, it's off to the fire fighting training part of the center, where different types of fire extinguishers and their uses are explained, followed by a brief opportunity for each participant to "put out" a fire displayed on a large screen using a water-filled, but otherwise real, fire extinguisher. Continuing on the same theme but upping the freak-out factor, visitors are led to the smoke maze section. There, small groups are forced to find their way out of a maze of doors, only some of which open, while imitation smoke (the same type used in Disneyland's Haunted House) pours in obscuring the view. A haunting and slightly claustrophobic simulation of what escaping from a smoke-filled building might be like. The main attraction is the fourth and final session, the earthquake simulation section. Here, participants watch a short video about the Great Hanshin Earthquake of 1995 and learn 10 tips to remember in an earthquake, before being led into a simulated dining room where a strong earthquake is about to hit. Sitting around a kitchen table in a room separated off from the main exhibit area, visitors practice taking cover under the kitchen table once the tremors start. As the earthquake grows to a strong 6 on the Japan Meteorological Agency scale, visitors wait out their personal preview of what an extreme earthquake would probably feel like. A sobering experience, softened only slightly by its artificiality. If you want to tackle your own earthquake or fire paranoia in a controlled setting, or are simply seeking an offbeat activity that is fun in a serious sort of way, the Ikebukuro Bosaikan is for you. Keep an eye out for cute-but-tough Hello Kitty The Firefighter goods on sale in the lobby. *The real answer to the survival dilemma: Get under a table, or if there is no table, get away from walls and things that might crash on you. Protect yourself and wait.